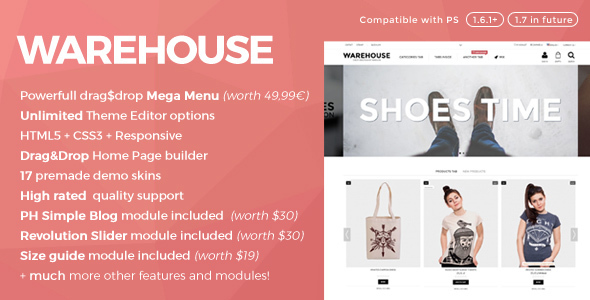 Warehouse is a clean, powerfull HTML5 responsive prestashop theme. Warehouse utilizes many advanced modules and modifications like(rollover images, clean cart, sliders, autocomplete, dialogs). Theme is SEO friendly and is Cross Browser compatible, it’s based on prestashop 1.6 default Bootstrap theme.